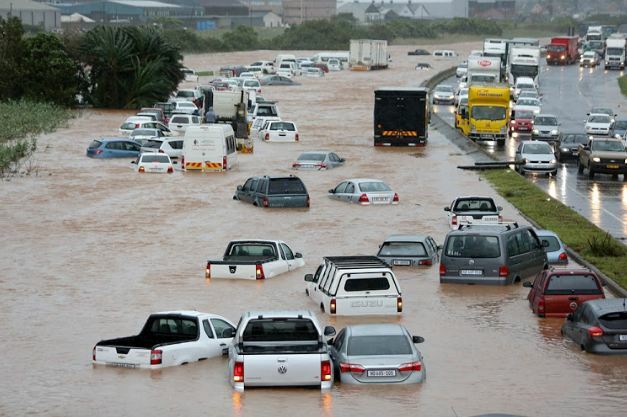 Eight people have been confirmed dead in Durban following heavy rains that have stormed the KwaZulu-Natal province. The 19-month-old was one of the victims of the storm that battered the coast of KwaZulu-Natal for more than 12 hours on Tuesday and left a swathe of destruction. It stalled trains and left motorists stranded on flooded highways. Hundreds of households were without electricity. Provincial health MEC Sibongiseni Dhlomo said that at Prince Mshiyeni Memorial Hospital, in Umlazi, a wall collapsed, killing two patients and seriously injuring two others. KZN emergency services spokesman Robert McKenzie said a 12-year-old boy drowned when he was swept away in a stream in Izingolweni, near Port Shepstone. Pictures on social media showed the extent of the destruction: cars washed away, homes flooded and trees crashing onto cars and blocking roads. The SA Weather Service said the “super-cell thunderstorm”, the most intense form of storm, characterised by a deep rotating up draft like a tornado, large hailstones, strong winds and flash flooding – moved from Gauteng to KwaZulu-Natal on Monday and to the Eastern Cape on Tuesday. Weather Service spokesman Hannelee Doubell said the service expected it to blow over within 24 hours. 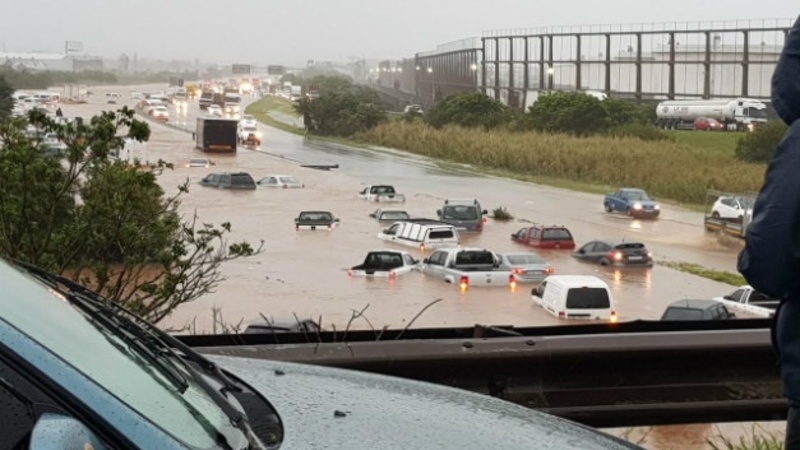 In Sarnia, west of Durban, three petrified men clung to each other as they watched the water rapidly rising up to the windows of the bus in which they were trapped on the M7, a municipal highway. Rescue Care advanced life paramedic Ceron Lennox, assisted by a colleague and an off-duty fireman, swam to the bus to rescue the men. In northern KwaZulu-Natal, the department of co-operative governance and traditional affairs reported two deaths in Nquthu local municipality. Other deaths included an eight-year-old girl who was struck by lightning and a 46-year-old man who drowned in a river.